Every business owner, who owns a freelancing business, a small business or a medium sized business, needs to use an invoicing tool. Choosing an invoicing tool is probably one of the most important decisions you will make for your business. Today we are trying to help you make this decision by giving you a list of the top 5 invoicing tools in the market. This is the latest and coolest invoicing tool in the market. And yes, you read that right;Apptivo free web based invoicing is absolutely FREE. Apptivo not only gives you a free invoicing tool it also has 40 other tools in the same platform so that you will never need to go and search for another tool again. The invoicing tool integrates with the other tools which they have, such as CRM, Project Management, and Timesheets etc. 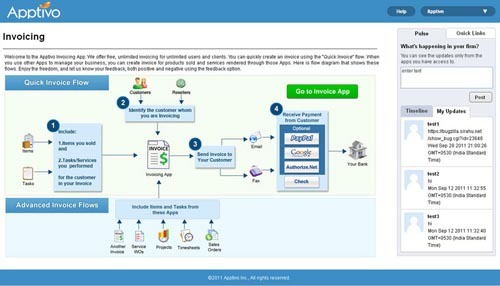 The focus is on usability so even if you are new to invoicing, you can get started with Apptivo easily. Apptivo also has released a free iPhone Invoicing App recently which is huge plus. Exclusive offer for SmashingHub readers: If you register for your free account before December 31, 2011, you will receive lifetime of 3GB premium document storage worth $60/yr. 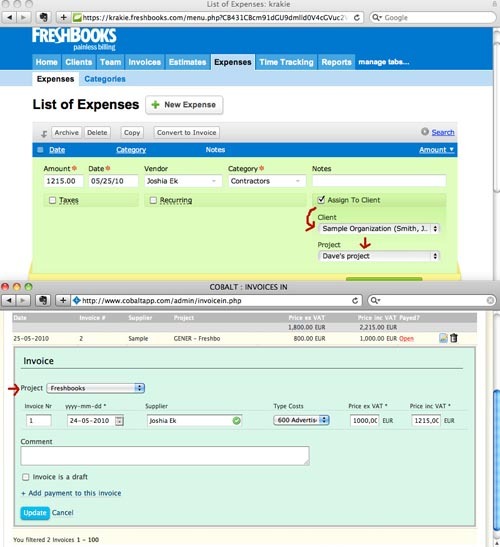 Frehbooks is one of the oldest and most popular invoicing tools in the market. A lot of bigger companies use this tool but it can be costly for the smaller companies. It has a free option with just 3 clients allowed and with no support for project management, timesheets etc. So if you are looking for a well-known name, don’t mind limited functionality and you are ok with paying some money try this out. Blinksale allows you to design your own interface with CSS. It is well integrated with Basecamp so getting your client list can be done efficiently. However, you will need an understanding of both Basecamp and CSS. So if you have the time and patience to design invoices using CSS, use Basecamp and are willing to pay $15/month try this out. Simple Invoice is an open source invoice program which is supported by the developer community. Although free, it does not have the necessary features and customer support which the other invoicing tools in this list have. SO if you are ok with waiting for getting support from your fellow users this is a good free tool to try out. 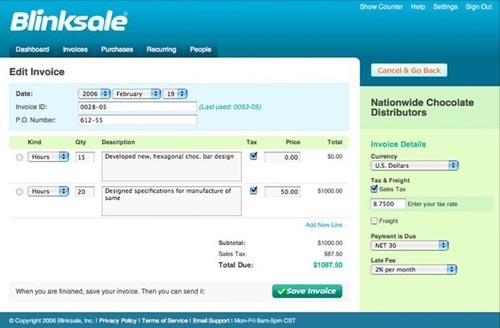 The invoice machine is very similar to the BlinkSale tool and provides an easy and professional tool to create invoices quickly. It allows only 3 invoices per month in the free plan, which is bit of a disadvantage if you have many clients you work with. You guys should add http://pancakeapp.com to this list and make It 6 you need to know about. It received a 9/10 from AppStorm and is what I use and love!